Follow the instructions for students on this site, and substitute <ki-id>@ku.dk for <ki-id>@alumni.ku.dk. This week, we have tried three new visual features in KemiKS. a) The students were strongly encouraged to use Maple in the solution of one problem, where they are supposed to draw the wavefunction of the hydrogen molekyle ion. This exercise was previously solved by hand, but now was supposed to be solved by using Maple. The students responded positively to it, although they had lots of problems in remembering how to use Maple. But when they finally had plotted the wavefunction, they really liked the fact that they now had created themselves the figures shown in many textbooks. 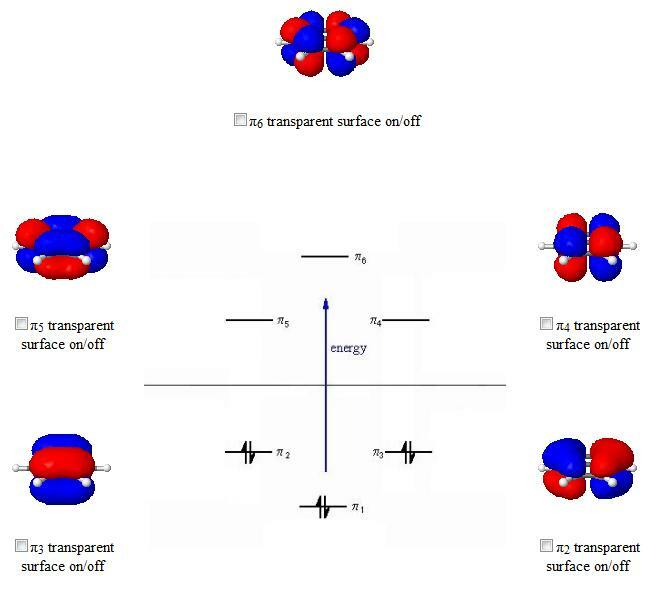 b) Janus had found a website at http://undergrad-ed.chemistry.ohio-state.edu/H-AOs/index.html, with a good discussion of atomic orbitals up to f-orbitals and a nice quiz. The student were asked to do the quiz in the first exercise class on monday as a repetition of what they had learned in the week on atomic orbitals. We will later in week 7 follow up on this idea and give the students in the beginning of the week a quiz on the key points of the week, which they probably will not be able to answer. At the end of the week, the students will then repeat the quiz and hopefully can see what they have learned in this week. Janus will look for appropriate tools in order to make a quiz with high score and solutions outside of Absalon. c) as illustration of the discussion of the Hückel method, we have now incorporated two java based Hückel programs (see description in previous blog), which can be run over the net or can be downloaded and run directly on ones computer. This was thought to have the big advantage that we can study much larger systems, which previously were out of question, when one had to diagonlize the Hückel matrices by hand. The students were then asked to use these tools in two of the problems of this week. One problem was newly made and the other was modified so that the students now use these Hückel programs instead of doing it by hand. Talking to the teaching assistants helping the students the response is mixed. 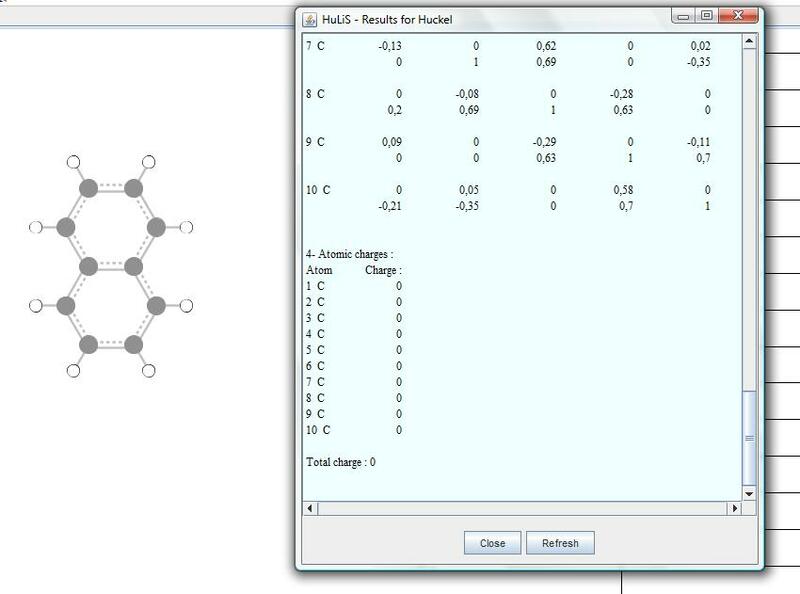 On one hand the Hückel programs are nice tools, but the danger exist that the students loose the understanding of how the Hückel matrix should look like, because in these Hückel programs it is generated automatically for them after drawing the molecule in the GUI. Therefore, it might actually didactically more effective to let the students write down the Hückel matrix by hand and then use Maple to diagonalize it, which is without computers typically the limiting factor or to have to exercises: one with the Hückel matrix by hand / Maple approach for a medium size molecule and one with the Hückel programs for a large molecule. Smelling vibrations: why do isotopomers have different smells? An interesting paper (I assume, I haven't read it yet) led to an interesting blog post (I did read that one) with an interesting discussion (be sure to check out the comments below, including those of the paper's author). Science in action and science in the open. There are things in this world you never learn. You either wish you never will, or thought you never would. When the topic concerns symmetry of molecules, I've used (and keep using) the good old C1 for quite some time without any hassle. Excuses for not exploring it have been many, but when I had to be assistant teacher in a course (KemiKS) which the Department of Chemistry at the University of Copenhagen offers, I had to sit down and buckle up. Visualising it in 3D proved to be the hard task, so I went on the web to find the symmetry@otterbein website. It has interactive pages where you can rotate around the molecules to get a good feel for where axis and planes are. It also includes a challenge so you can learn to use the flow charts that follows every book on the subject. A COMS Seminar Calendar has been created. You can add it to your favorite calendar program by using the link. This will be maintained by Casper Steinmann. For detailed information, look at the appropriate page about the COMS Seminars on the COMS homepage. The Center of Excellence pre-proposal I, Thomas Hamelryck, Flemming Poulsen, and Jesper Ferkinghoff-Borg submitted to the Danish National Research Foundation (Danmarks Grundforskningsfond) was one of 27 selected out of 198 for the second round. The proposal builds on Anders Christensen's Ph.D. project on protein structure determination using chemical shifts. The proposal deadline is the 28th of April, and we'll know if we made it some time in October. I have several openings for postdoctoral positions in different areas of theoretical and computational chemistry and physics in my group at UC Irvine. I will appreciate it if you could bring this to the attention of suitable candidates. Simulation of amyloid fibril structures and aggregation kinetics, lipid-protein complexes and antibody interactions and how they can be probed by novel multidimensional spectroscopy ranging from the infrared to the ultraviolet. Developing time-dependent many-body approaches to nonlinear x-ray core-electron spectra and their description in terms of real-space and real-time wavepackets of electrons and nuclei. Computational tools will be implemented for the design and analysis of measurements involving multiple ultrafast optical and x-ray pulses. Developing and applying time-dependent density functional, nonequilibrium Green?s Function techniques and exciton models for computing electronic excitations of molecular assemblies, light harvesting complexes and current-carrying molecules. Connection is made to quantum information processing and manipulation. New optical signals which use entangled photons, pulse shaping, and coherent control algorithms are designed and simulated for probing molecular relaxations and exciton transport. I presented the method used in the paper by Parks, Hu, Rudolph, and Yang. Links to the papers can be found here. The QM region is defined on slide 2 and is treated at the B3LYP/6-31G(d) level if theory while the rest of the protein and solvent is treated by the Charmm22 and TIP3P force field, respectively. Gaussian is used for the QM calculations and Sigma is used for the rest. The covalent boundary is treated by Yang's pseudobond method, where the link atom is described by a pseudopotential that gives the atom a valence of 1, but an equilibrium bond length close to that of a C-C single bond. An explicit solvation model is used, with a 12-Å shell of frozen water to handle the water-vacuum boundary. No other constraints are imposed. An approximate TS is located with the Quadratic String Method (QSM) - a method used to interpolate between reactants and products. It is not clear from the paper whether the approximate TS is refined further with QST3. 1. A QM/MM energy and gradient is computed for a reference QM and MM geometry along the QSM path. 2. The charges of the QM atoms are computed, and are used to run all and all MM MD (keeping the QM geometry frozen). 3. The energy and gradients are corrected using a Boltzmann weighting scheme and approximating the QM/MM electrostatic energy as point charge interactions. 5. Steps 1-4 are repeated so self consistency for each point along the QSM path. 6. Upon self-consistency, the vibrational frequencies of the QM region are computed. It is not clear from the paper what charge scheme (slide 13) the study uses. This is perhaps the most sophisticated treatment of dynamics in QM/MM to date, but also the potentially most complicated and error-prone. From a "dynamics perspective" it is best to keep the QM region as small as possible, since its conformational space is not explored extensively, but the accuracy of the QM/MM interaction energy may suffer. are using theoretical methods in their research, either as a technique per se, or as a complement to experimental work. As a result there is a growing need to acquire the background knowledge necessary for skilful use of these methods. The European Summer School in Quantum Chemistry (ESQC) was started with the aim of disseminating such knowledge. The first school was held in August 1989 under the direction of the late Bjørn Roos. The emphasis of the school is more on understanding than on the technical aspects of methods and much time will be devoted to the discussion of different electronic structure problems and the choice of appropriate methods for their solution. The course will consist of both lectures and tutorials. I here share two examples of online Hückel approximation programs. The first is located here and denoted a) in the following, while the second example, b), may be found here. Please note, that b) may be slightly unstable towards refreshing the site but may still be adequate from a teaching point-of-view, though, as it is readily downloaded as a Java-file. Update: Program a) is available in a newer implementation here (thanks to Rafael R. Pappalardo for pointing this out in the Comments). This program furthermore enables the option of illustrating the MOs. A MO diagram is build 'on-the-fly' as the user builds the bonds between the individual atoms, and by clicking the 'Show Molecule' tab in the lower right corner, the MOs are shown in accordance with the MO diagram. Note here, that the orbital energies are shown in the lower part of the screen when the user shifts between the individual MOs by clicking the 'Up' and 'Down' tabs next to the 'Show Molecule' tab. As touched upon in the above, this program only offers sp2-hybridized orbitals in accordance with regular Hückel theory. The bonds may be altered, though, in an indirect manner, as the alpha- and beta-parameters are modifiable. As this program has shown to be rather unstable towards running directly from the browser, I would recommend downloading it by clicking the download link below the applet. The file is just a regular .jar file but advantages with respect to the browser applet in the fact that it is faster and more reliable. Furthermore, I will not comment on the Lewis part of the program, only the Hückel part. The Hückel Hamiltonian (in contrast to program a)). Note that the form of the matrix is in accordance with the numbering within the molecule and may thus not resemble the expected. The orbital energies in terms of the alpha- and beta-parameters. The atomic charges as well as the total charge. As in program a), the degree of hybridization may be altered but in a fancier manner. By clicking the box 'Parameters' in the left side column, and subsequently clicking on one of the individual carbon atoms, the program lets the user change the atom type and hence the final Hamiltonian, etc. UPDATE: As pointed out by Markus in the comments, you can also display MOs in HuLiS by clicking on specific MO's on the energy graph. Thanks to Markus for this comment. - Benzene: Use this link (see below) to illustrate the benzene MOs as a supplement to the MOs from program a). Edit. 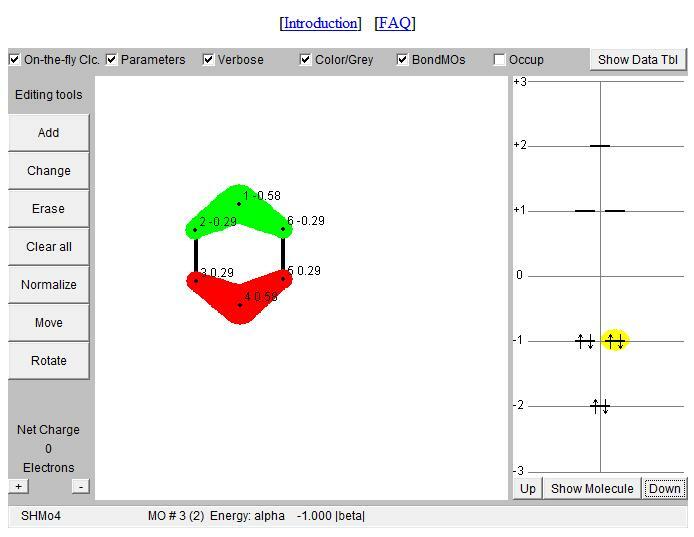 As Jan mentions in the comments, this section of chemtube3d also serves as a great tool of visualization for the MOs of benzene. - Naphthalene vs. Azulene. Calculate the differences in the HOMO-LUMO gap. Why does these differences exist and why is azulene dark blue, while naphthalene is colorless? - Why is it impossible to design and describe 1-methylnaphthalene within the ordinary Hückel approximation? What is the 'Hückel equivalent' to 1-methylnaphthalene? - Topic of discussion: If we really were to attempt a description of 1-methylnaphthalene, how could the program be manipulated (Hint: Think in terms of alternative ways of describing hybridization). Here are the slides from my talk "Modeling Chemical Reactions (in Enzyme Active Sites)" that I'll give on Monday (February 14) as part of the Ph.D. course Biostructure and Molecular Modeling in Drug Research over at the Faculty of Pharmacy. COMS received at grant from the Education at its Best (Den gode uddannelse or DGU) initiative last week (see announcement here) to hire students to help incorporate visualization and molecular simulations into chemistry education. The best place to start it to create a page of resources for each course that lists what is currently available, much like this one. I have created a new web page to collect these resource pages. 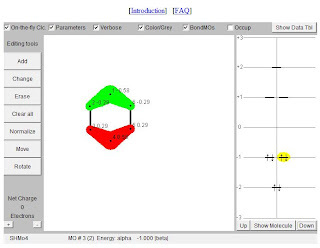 Here are some other links to posts from my blog: that describe how to incorporate visualization and molecular simulations into chemistry education. Here are the slides from my talk "Drug Design and pH" that I'll give in Thursday (February 10) as part of the Ph.D. course Biostructure and Molecular Modelign in Drug Research over at the Faculty of Pharmacy. When students experience chemistry as “tough stuff”, it’s often due to the difficulty of fully appreciating molecules that are too small and reactions that are too fast. Chemistry professor Jan Jensen has a method of making chemistry much more visible. Using computer-based simulations and visualisations, he offers his students a more intuitive and less abstract gateway into the field of chemistry. Now, Jensen and his colleagues at the Centre for Computational Molecular Science have received 200,000 kroner from the University’s “Education at its Best” project to develop and diffuse visualisation tools throughout the courses of his fellow chemistry instructors. He is convinced that these tools will make it a bit easier to become a chemist. “In the oral examinations, I’ve noticed that even those who are quite poor at equations have improved in their ability to explain what is going on at the molecular level,” explains Jensen. In the coming months Jensen and his collaborators in the Centre for Computational Molecular Science will adapt the visualisation tools to courses at the University of Copenhagen. The hope is that ambassadors from the Centre will ensure that the visualisation methods spread like ripples across water. While Jensen expects to employ student interns to create finished “instruction packages”, he encourages curious professors to sign up for the development phase. “I am confident that this will make it easier to teach chemistry. But here at the beginning, it would be more fun to test ideas in collaboration with professors who actually have a desire to use these tools,” affirms Jensen who is confident that these methods will benefit instructors as well. “I have a few lectures where I do not use the visualisations and I can clearly see that I lose the students’ attention,” concludes Jensen. Read Jan Jensen’s blog post about visualisation. Most equate study abroad with academic challenges. But For Kasper Steinmann, the chance to study in the Tokyo suburb of Tsukuba offered lessons which proved to be very human. Many questions and discussions during the first lecture. The course is off to a great start. We started by drawing dates and papers and a list of who does what can now be found on the course web page. You are free to switch dates and papers if you can find someone to switch with. I also briefly introduced the requirements for the extra credit assignment. There are now more details here. The most practical way to gauge the whether the division into QM and MM regions is correct is to enlarge the QM region and see if the results change significantly. This is rarely done. If I find some references I will put them here. Enlarging the QM/MM region will introduce more cuts across covalent bonds, which could increase the error. However, the cuts will be further away from the active site, so the effect on relative energies should be smaller, and they should converge as the QM region is increased. I am not aware of any QM/MM study that does not place the cut between the alpha and beta carbon on the side chain (I would very much like to hear about exceptions). This is due to the fact that QM/MM boundaries are heavily parameterized, and need to be redone for other types of cuts. This places restrictions on how much the QM region can be enlarged. Slide 12: In the link atom method, there are interactions between the MM charges and the link H atom. It is not really feasible to remove the “H-part” of the density. Slide 16: Most QM/MM methods consist of a QM and MM program hooked together, sometimes by a third piece of software. The only “fully integrated” package I know of is Qsite, a commercial program from Schrodinger. Kasper has put up some more info here. Predicting protein pKa values: problem solved? Quantum chemistry has reached a point where some gas phase properties of small molecules can be computed more accurately than they can be measured. For these systems science can say "problem solved", give itself a light pad on the back, and move on to other things - like how to do the same for molecules twice the size. Or in solution. I don't believe there is an equivalent success story in biomolecular modeling, but, as I'll argue here, the prediction of the pKa values of ionizable residues in proteins be a close contender! Jens Erik Nielsen and co-worker recently published a very interesting paper entitled "Remeasuring HEWL pKa values by NMR spectroscopy: Methods, analysis, accuracy, and implications for theoretical pKa calculations" in Proteins. One of the most interesting implications of the paper, in my opinion, can be found at the bottom of Table III. Here the authors compare Asp, Glu, and His pKa values in HEWL measured using the NMR chemical shifts of backbone nuclei to those obtained from side chain 13C atoms. The RMSD values are 1.3, 1.2. and 0.6 pH units for 15N, 1HN, and 1Hα, respectively (note that the latter could only be obtained for 7 of the 11 residues). Now compare this to the corresponding values for pKa values predicted with the pKD and PROPKA servers: 0.9 and 0.8. Thus, if you are not willing to go through the considerable trouble that is assigning side chain chemical shifts for a protein, you are better off predicting the pKa values than measuring them! At least for this protein ... and only if you can't live without knowing all the pKa values ... but still. Nielsen and co-workers estimate the accuracy of the 13C-derived to be accurate to within 0.1 - 0.2 pH units, so, no, the general problem is not solved. But if more people do as careful a job measuring pKa values as Jens, we may find that we are closer than we think. Henry Rzepa: Is there a difference between a scientific blog and scientific journal? 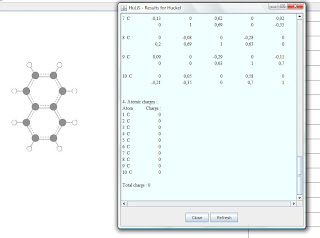 with chemCanvas, an open source chemical diagram editor.